UPDATE 20th April 2015: Coldingham is listed on the list of exchanges next for upgrading! If you're following the national superfast broadband rollout you'll know that progress across Scotland is steadily being made. In the last few weeks, I've noticed several new green fibre cabinets popping up across the Scottish Borders, and some are even getting close to where I live! However, it was with disappointment that I read most recently that although the exchanges of Ayton and Eyemouth were being upgraded (by the end of 2014), Coldingham was not yet on the list. How could a village like Coldingham, the same size as Ayton but with a swelling tourist population in the summer, be left behind? I decided to investigate. By effectively making a nuisance of myself, I made contact with a very helpful senior member of the Digital Scotland project team. He explained the reason. The BT infrastructure, made up of local exchanges and larger aggregation points was the reason Coldingham was being upgraded on a different timescale to the towns and villages around it. Both Eyemouth and Ayton exchange are connected to (aggregated by) an exchange in Berwick which already has superfast equipment installed. 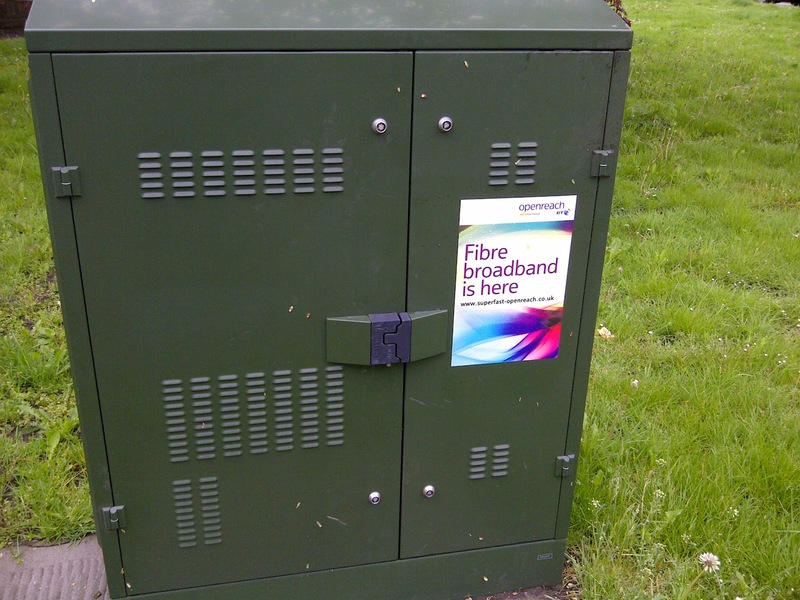 However, Coldingham (along with Reston, Abby St Bathans and Cockburnspath) is connected to an exchange at Grantshouse - and you guessed, it doesn't have the superfast equipment installed yet. Therefore, any work to enable broadband in Coldingham is dependant on Grantshouse getting it first. The good news is that we are scheduled to receive superfast broadband, the current plan enables this in July-December 2016. At the time of writing, that's still some way off which is frustrating when our immediate neighbours are able to stream cute kitten videos so much faster. The next question is of course whether you'll actually see an improvement in speed when the technology arrives! BT are installing new green street cabinets like this one that are closer to your property and therefore can offer faster speeds to your home. But where they are placed and how many are built is still a mystery, even to the project team! Each one can cost anywhere between 15K to 50K depending on the available land, power and access, but BT are being incentivised by the number of houses they "enable" and also by the number of houses they enable at above 24Mbps (the European standard that subjectively defines what 'superfast' means). So here's hoping you get one near to you! The good news is that the Scottish rollout is looking at alternative technologies that still deliver superfast speeds to those who are more remote. Fibre-Optic cable all the way from the exchange to a house is known as FTTP and is being used in some cases in the Borders. This is the ultimate goal as it will enable a completely future-proof connection without the problems associated with copper cables. Secondly, they are looking at a relatively new method of delivery called Fibre to the Remote Node (FTTRN) which effectively puts a much smaller version of the green cabinet on top of a telegraph pole nearer to your house. If you want to know more, the Digital Scotland website gives some good information and they've just updated their map tool to show more detailed information about specific locations.